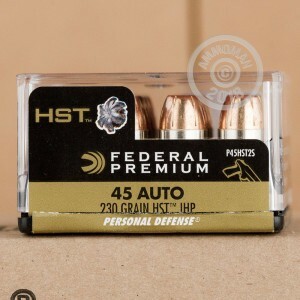 HST ammunition is Federal's most advanced self-defense offering. These .45 ACP cartridges ire a heavy 230 grain jacketed hollow point that provides wide six-petal expansion for quick takedowns of threats to life or limb. 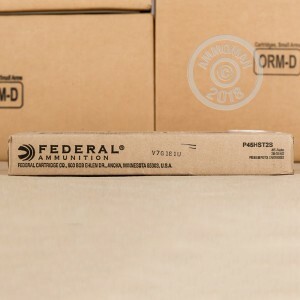 Each round in this box of 20 produces a muzzle velocity of 890 feet per second. 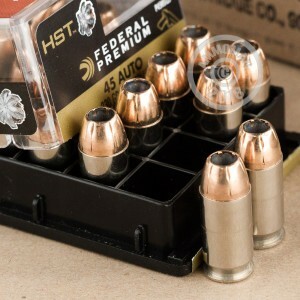 Like other HST ammo, these cartridges are made in Anoka, Minnesota using non-corrosive Boxer primers and nickel-plated brass cases. Enjoy free shipping from AmmoMan.com on all orders over $99!